The Brits in Toronto crew are always on the lookout for cool books to read on the TTC, when it’s running. 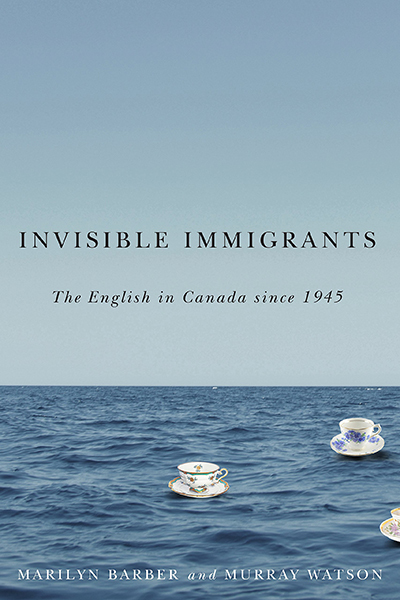 We heard about this one today — “Invisible Immigrants: The English in Canada since 1945”. “Despite being one of the largest immigrant groups contributing to the development of modern Canada, the story of the English has been all but untold. In Invisible Immigrants, Marilyn Barber and Murray Watson document the experiences of English-born immigrants who chose to come to Canada during England’s last major wave of emigration between the 1940s and the 1970s. Engaging life story oral histories reveal the aspirations, adventures, occasional naiveté, and challenges of these hidden immigrants. Are things the same today as they were then? Do we identify as “foreign” when we say “settee” instead of “Chesterfield”? Grab the book, give it a butcher’s and send us a review if you like. We’ll post it. Promise. The publishers kindly gave permission for us to print an excerpt and supplied a couple of nostalgic photos. 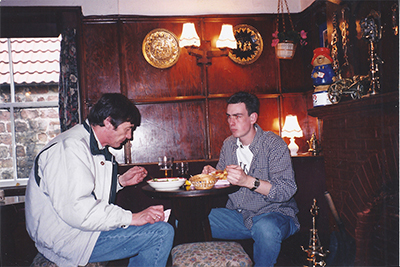 Ye olde English pubs were a nostalgic memory for many landed immigrants from England. This extract from “Invisible Immigrants: The English in Canada since 1945” reveals what the English thought about Canadian drinking habits and “puritanical” liquor laws. 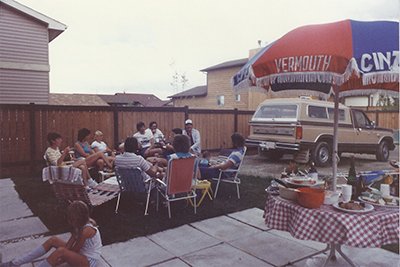 As many English immigrants realized soon after arriving in Canada, the variety of food in part reflected contributions made by diverse immigrant groups to the country. Although they had to learn new methods and products for cooking, English immigrants could choose the extent to which they wished to partake of the variety of food in Canada. No interviewee mentioned feeling deprived of traditional English fare. He noted that pubs in England had changed over the years — many were now more restaurants than pubs — but the warm feeling for the English pub that he had known remained with him. Peter Semple was one who frequented the pub opposite his Toronto workplace for lunch and sometimes also immediately after work at six o’clock, but even this regular attendance was not the same as taking the cat on his shoulder down the road to the pub for the evening. A pub could become a meeting place for English immigrants. Peter Robinson, the popular mystery writer who came to Toronto in 1974, recalled that in his early years in Toronto he felt culturally isolated, surrounded by Portuguese and Greek neighbourhoods. To compensate, he regularly drank at the Feathers’ Pub, which was frequented by expats; their accents “provided a comfort zone” that made him feel English. More often, the interviewees emphasized the contrast between Canadian drinking places and the English pub. Charles Hall had not gone to a pub regularly in England but liked to have pubs available as a place to go and have a few leisurely drinks; living in Montreal, he found that people who went to Canadian night clubs drank much more and finished the bottle. In 1950s Ontario, female English immigrants felt particularly excluded by the restrictions imposed on Ontario bars following the prohibition period of the earlier twentieth century. Gradual modifications of Ontario’s drinking laws eventually eased the restrictions, and such laws were never imposed in Quebec, but English immigrants continued to miss the English pub. Excerpt from “Invisible Immigrants: The English in Canada since 1945” by Marilyn Barber and Murray Watson, published by University of Manitoba Press. This entry was posted in Uncategorized and tagged brits in toronto, invisible immigrants the english in canada since 1945, marilyn barber, murray watson on April 20, 2015 by britsintoronto.